Thursday, August 18, 1859.Springfield, IL. Lincoln writes to David J. Powers, of Madison, Wisconsin, regarding Powers's invitation to speak on September 30, at the Wisconsin Agricultural Fair in Milwaukee. 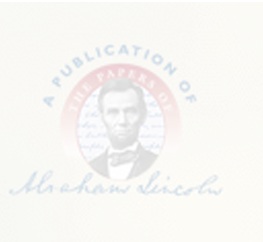 Lincoln explains, "Two difficulties were in the way—first, I could not well spare the time, from the courts; and secondly, I had no address of the sort prepared; and could scarcely spare the time to prepare one . . . I was waiting, before answering you, to determine whether these difficulties could be surmounted. I will write you definitely on the 1st. day of September, if you can safely delay so long." Abraham Lincoln to David J. Powers, 18 August 1859, CW, 3:397. Lincoln's account at John Williams & Co. is charged $2.50 for two pairs of "Heavy Drawers," and Mrs. Lincoln buys table cloth, napkins, and handkerchiefs at Smith's. Pratt, Personal Finances, 140, 158.